ALBAN, ONTARIO — Brian O’Rawe blames it on the Glenfiddich. The scotch went down easy and took with it any inhibitions he had about buying the Sand Beach Lodge more than five years ago. “I went to bed that night and woke up in the morning and told my wife, ‘I think I just bought this place,’” O’Rawe says with a storyteller’s bemused expression while sitting on the same bar stool where the deal was struck. It’s a warm day in early June when we talk and outside a boat grrrrs past, carrying a quartet of fishermen down the 105-kilometre-long French River that historians have nicknamed the Fur Trade Highway. The Voyageurs, those French explorers and trappers sent out first by Samuel de Champlain in 1615 to discover what stirred in this giant country, trekked down the river and back to Quebec, hauling pelts of beaver, wolf, and elk — and stories of aboriginal encounters and unforgiving land. Despite the dangers, the Voyageurs kept coming and coming, for more than 200 years until the merger of the Hudson’s Bay Company and the Northwest Company in 1821 shifted the trade route north. A Scotsman, O’Rawe has latched onto the spirit of those adventurous men. He visited the lodge many times after moving to Toronto about a decade ago, and realized he was happier spending his days in the pristine wilderness setting of French River Provincial Park than in the bustle of Canada’s largest metropolis. O’Rawe also knew a good thing when he saw it. A former consultant for international hotel companies, including Mandarin Oriental, O’Rawe was convinced the lodge and its setting would be a draw. Once you’ve gazed on French River, you’ll be convinced it was his business savvy not the scotch that steered him to purchase the property that was built by the Seagram whiskey clan in the 1920s as a family retreat. French River is quintessential Canada: big, empty, beautiful, welcoming, and calm. 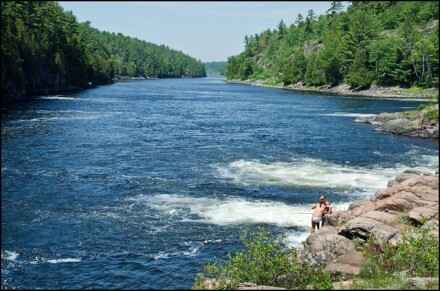 It’s not just Europeans who should be making their way to discover French River. Canadians will appreciate a visit too, especially those who are seeking the solitude and natural beauty that commercialization has taken from parts of Ontario’s most popular cottage destination. One hour north ofMuskoka, French River gives you the kind of escape many Ontarians now feel they must fly away to enjoy. When I make the three-hour drive from Toronto, I find the summer rush has yet to come. Except for a few visiting journalists, the only guests at Sand Beach Lodge are a couple from Michigan who happened to show up only because the French River Visitor Centre directed them to O’Rawe’s spot. “We asked for a nice place with good food and this was where they recommended. We’re very lucky. This is a beautiful lodge,” Barbara Taylor said. The lodge has had its starring moment, hosting a Disney crew during the filming of the Jonas Brothers’ teen flick “Camp Rock 2″ (the brothers, though, didn’t stay at the lodge because the movie’s security staff believed the river presented too many opportunities for crazed teenage girls to make a mad attempt at invasion, O’Rawe informs with a laugh). Sand Beach’s usual clientele includes families, couples, fishing groups, and corporate types looking for group getaways. Retention rates are exceptionally high, O’Rawe says, noting that guests return time and again, including a German family that has been coming back for four generations. Although it’s a fishing lodge, many Sand Beach guests arrive aiming to escape the pace of urban life and to indulge in chef Ryan Trotter’s cuisine. Dinners include four courses that are all delightful, making you wonder how food so good can be found so far from a big city. “We try to be as local as we can be, but it’s hard out here. So we will go out and get the best products in Canada we can find,” says Trotter, whose beef tenderloin is a thick cut from Alberta, served peppery and flavourful.